By Eric Thomas: Dillian Whyte says former heavyweight champion Wladimir Klitschko will be making a comeback to boxing, and that he lied recently when he denied that he’s planing on returning to the sport. Whyte (25-1, 18 KOs) says the 42-year-old former IBF/IBO/WBA/WBO champion Klitschko (64-5, 53 KOs) was offered a fight against him, but he didn’t want to take it right away because he wanted to have two warm-up fights before he did return to the ring. Whyte, 30, says Wladimir will definitely making a comeback in the near future. As far as Whyte is concerned, he sees it as a major compliment that Wladimir wanted to have a couple of tune-ups before he returned to face him. “That’s a lie. Klitschko is definitely coming back,” Whyte said to Behind the Gloves, when asked about Wladimir saying that he’s not coming back. “We offered him the fight, and he said he needed two tune-up fights first before he fights the likes of me, which is a massive compliment, because he’s a former unified world champion. He unified for so many years. It’s a massive compliment to me that he didn’t believe he could come back fight with me. He wants a warm-up fight. So he’s definitely coming back. There’s definitely truth to it. He’s 100 percent coming back,” Whyte said. It’s hard to comprehend why Wladimir would want to fight Dillian Whyte in his comeback rather than one of the popular heavyweights like Joshua, Tyson Fury or Deontay Wilder. Whyte has a following in the UK, but ends there. He’s not as popular as Joshua in that country. Joshua and Fury are the fighters that have beaten Wladimir in his last two fights, and those were both winnable matches for him. Had Wladimir fought better, he would have beaten Joshua and Fury. It’s perfectly reasonable for Klitschko wanting a couple of tune-ups before he does come back. Wladimir hasn’t fought in close to two years since his loss to Anthony Joshua in April 2017. Before that, Wladimir had been out of the ring since his defeat at the hands of Tyson Fury in November 2015. Wladimir had two fights in the last four years. It goes without saying why he would want to take a couple of tune-up fights. “Klitschko is a smart fighter. He knows how to play with the media,” Whyte said. “He’s done this for many years. When he fought Joshua, he said there’s no chance he’s coming back. Then all of a sudden, there’s Joshua vs. Klitschko,” Whyte said. It’s possible that Wladimir is playing with the media like Whyte says. He might not like the idea of Whyte revealing his comeback plans before he’s ready to spring them on the boxing media. But never the less, Wladimir is not going to fight Whyte straightaway when/if he does make a comeback. Like Whyte said, if Wladimir comes back, it’ll be for him to fight a couple of tune-ups first. And you have to believe that if Wladimir looks good in those two tune-ups, he’ll want to fight Joshua, Fury or Wilder rather than Whyte. Joshua or Fury would be the most logical opponents for Wladimir when or if he does return to the ring. Those guys beat Wladimir, and it has to bother him ore than a little that he lost to those two in fights that were very winnable if he’d fought smarter and listened to what his trainer Johnathan Banks was telling him to do. If Wladimir does come back, he needs to get a different trainer. There’s nothing wrong with Banks, but Wladimir has shown that he’s not able or willing to follow the instructions that Banks has been giving him. What Wladimir needs is a smart trainer that he’s willing to listen to and follow their instructions to the letter. If Wladimir had the type of trainer that he listened to, he would have beaten Joshua and Fury. It’s unclear who Wladimir needs for him to train him to beat Fury and Joshua. Klitschko needs a trainer that loses his temper a little, and can force him to do the right thing. Teddy Atlas would be a good one. He wouldn’t put up with Wladimir not doing what he’s asking him to do. Atlas would let Klitschko know immediately that he wasn’t doing what he wanted him to. The working relationship might not be a good one if Wladimir decided to be passive and do whatever he wants inside the ring like we saw in his fights against Joshua and Fury. Wladimir fought like he was on cruise control, not doing what his trainer Banks was asking him to do. What Wladimir was doing was clearly not working, and yet he still wasn’t into following what Banks wanted him to do. Whether Wladimir thought he knew more than Banks is the big question. Whatever the issue was, Wladimir needs to get another trainer, one that’ll listen to. Wladimir will be turning 43 in November. Against the right level of opposition, Wladimir can win, even if he’s basically training himself, and ignoring what’s being told to him by his cornerman during his fights. Wladimir likely has gained confidence that he can come back and be successful after seeing what Tyson Fury did in coming back from a long 2 1/2 year layoff to do well against Deontay Wilder in their fight on December 1. Fury shed close to 150 pounds in coming back from around 400 lbs all the way to 250+ lbs, and he gave Wilder all he could handle in their fight. Had Fury stayed on his feet in the last four rounds of the fight, he would have won. 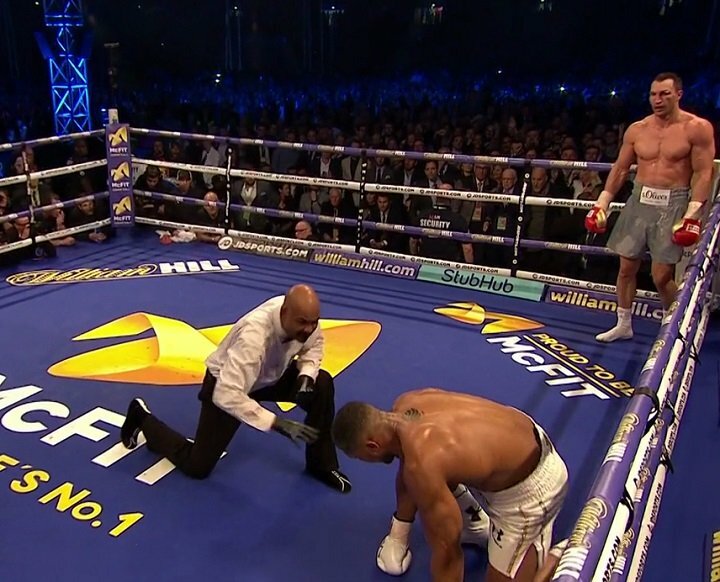 As it is, the fight was scored a controversial 12 round draw. Fury might beat Wilder in the rematch. If Fury was able to find success in coming back after a long layoff, the faster, stronger and better skilled Wladimir can do the same. Wladimir is still faster and more powerful than Fury, even at 42.